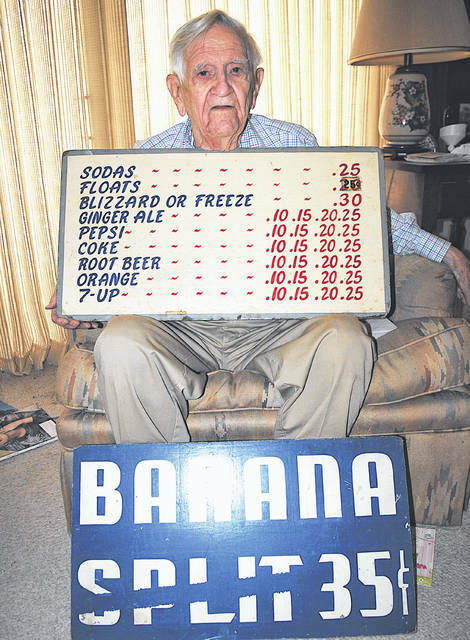 Howard Ellis is pictured in his Hillsboro home with a pair of signs that were in use at the Dairy Queen in Hillsboro around 1953 or 1954. It seemed like an unlikely pairing — a Dairy Queen next to a stockyards — but for 45 years, Howard Ellis made it work and then some. He said it is because quality was the name of his game. Ellis opened the business on July 6, 1950, and sold it in April of 1996, just a month after he opened it for the season. While he never had a plan to own an ice cream store, Ellis said he would do it all over again if he had the chance. “Absolutely. Yes sir,” he said. And when he started in 1950, he had no idea he’d be there 45-plus years later. “No way,” he said. But the money was good, and he was comfortable. “It was a good business. It was profitable and we liked the business,” he said. It was ball games in Washington C.H. that set Ellis on what ended up being his career path. Ellis said that after playing baseball for an American Legion team, some of the guys would stop at the Washington C.H. Dairy Queen after a game and get a milkshake. He really liked those milkshakes, and as it turned out, the wife of one of his buddies was a niece to the owners of the Dairy Queen in Washington C.H. The owners told him how to get in touch with the Dairy Queen district operator, and Ellis and a partner looked at locations in Gallipolis, Portsmouth, Athens and Clyde. But there was a new building on the west side of Hillsboro along U.S. Route 50 that had been mostly completed, and when a dentist couldn’t get the money for the equipment he needed for the building, Ellis and his partner leased it. Not long thereafter, his partner’s wife lost a child at birth, then she got pregnant again, and they decided to move back to Washington C.H. On March 1, 1953, Ellis married the former Betty Waits. She passed away in 2004. What he actually did was mortgage a farm he owned in Fayette County — he later owned two farms in Highland County — to get the money to buy his partner out. Over the years Ellis made few changes to the small building where he started his Dairy Queen. He said he sold only ice cream products until 1956, then started selling hot dogs and footlongs, and eventually added BBQ and roast beef. He said he quit offering the roast beef because it did not sell well. In 1973, he added a small storage building to the grounds, but said that was about it for the changes. One thing that helped the business over the years, Ellis said, was when Rocky Fork Lake opened in the 1950s and traffic started pouring down U.S. Route 50. “When it opened I got all that Cincinnati crowd heading to the lake for years,” he said. The only thing that bothered them, Ellis said, was the flies from the stockyards that had opened next door a year or two before the Dairy Queen opened. Most of Ellis’ memories of his years at the Dairy Queen are of all the kids who worked for him. Born March 28, 1925, Ellis originally lived on a 40-acre farm outside of New Martinsburg. He attended school for eight years there, then finished with four years at McClain High School in Greenfield, graduating in 1943. For a time during his high school years he worked at a cousin’s drug store, but in October of 1943 Uncle Sam came calling. Ellis entered the U.S. Army Air Corps, but after 28 of 30 days field training at Jefferson Barracks, Mo., an old Civil War camp along the Mississippi River, he came down with pneumonia and ended up in a hospital for months. He said that for four days, he didn’t know up from down. His temperature was 104 degrees, and finally broke on the fourth day. “One more day at 104 and I would have been gone,” he said. He said he was discharged from the service in March of 1946, and lived at his mother’s farm until he landed a job at International Harvester in June that year. For his birthday Thursday, Ellis planned to visit his daughter, Cathy Ford, at her home in Ridgeville, Ohio. He said he has been blessed, and that there is only one reason he has lived as long and as well as he has. “Only God. I’ve been a Christian all my life. What else can you attribute to?” he said. There have been a few setbacks, Ellis said, but the vast majority of his life has been good. He said he takes life more easy these days, and is proud of the product he offered at the Dairy Queen.